Last year's trip through New Mexico and southern Colorado had whetted our appetite for more of the desert Southwest and Anasazi ruins, so we set off to explore the Four Corners area (where Arizona, New Mexico, Colorado and Utah meet). We planned our route to visit Canyon de Chelly, Monument Valley, Valley of the Gods, Grand Staircase Escalante National Monument, and anything else between here and there. So we packed up the Jeep and headed northwest from Austin, Texas, early on Saturday, 17 June 2000. We had thought we would spend the night in Clovis, New Mexico, but it was only about 4 PM when we got there, so we decided to drive on to Fort Sumner, New Mexico. I knew Fort Sumner was the place where Billy the Kid was buried, and that it was near an historic U.S. Army fort, but I had never done more than buy gas there and pass on through. Sybil and I didn't even buy gas--the town looked so dead we decided to proceed to Santa Rosa. Actually, I think there may have been more to it, but we didn't see any signs to point us to anything interesting and we were starting to get tired. Later, when we toured the Navajo Nation, we learned that in November of 1863 Kit Carson rounded up some 9,000 or so Navajo men, women, and children in northeastern Arizona and walked them across New Mexico to Fort Sumner. Under orders, he also destroyed their crops and livestock. Three years later, only about 4,000 Navajo had survived the starvation, the smallpox, and the return "Long Walk" to their homeland. 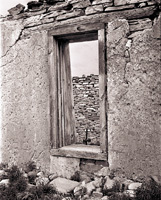 Another 1,200 or so Navajo had managed to hide in the canyons of Arizona, and several hundred hid or escaped to Alamo, New Mexico (the Puertocito Navajo). Santa Rosa, New Mexico is a lovely green crossroads community next to a natural spring called Blue Hole near the upper reaches of the Pecos River. In spite of I-40 and all the motels, it is a quiet little town. Historic Route 66 came through here. Our friend, Eric Beggs, who has this thing about visiting every spring he can find, had told us about Blue Hole before we left. Sybil and I obtained a modest but clean and comfortable room at Motel La Loma for about $30. We had drinks in our room, then had an excellent meal at Joseph's Restaurant and Cantina right next door to the motel. It's the oldest family-run restaurant in town and they had everything from doughnuts to broiled trout, and a history of the area on the menu. After dinner we drove off in search of Blue Hole. 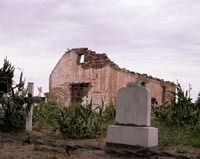 We drove South on State Route 91 (South 3rd Street) and quickly realized we were going the wrong way, but found an old crumbling adobe church in the middle of a cemetery that looked interesting. 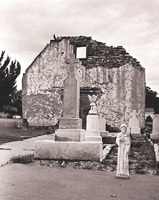 Later we learned that this was the original chapel of the parish of Saint Rose of Lima, after which the city is named Across the road was a turquoise and white Southwestern style house, now a mortuary, that was the home of Santa Rosa's founder, Celso Baca. We stopped and took photographs in the cloudy grey New Mexico light. I was shooting with my Mamiya 7 camera on my new Slik 803 carbon fiber tripod, and Sybil was using her Canon S20 digital camera as well as her Canon EOS Rebel XS. It was getting late and the light was not good, but we did the best we could under the circumstances. After photographing the old church we continued out State Route 91 all the way to Puerto de Luna. The valley that Route 91 follows is wide, with red cliffs on the sides, lush green grass on the valley floor and a clear spring-fed stream--the Pecos River--running down the middle. It doesn't seem possible that this is the same river that peters out to a muddy brown dribble by the time it reaches Texas. A strategically-placed historical marker informed us that Puerto de Luna was one of the earliest settlements in New Mexico. Its only other claim to fame (aside from its native beauty) is that Billy the Kid was said to have had a lot of friends there. There did not appear to be a lot to see in Puerto de Luna, so we returned to Santa Rosa and attempted once again to find Blue Hole--turns out it was just off Route 66 on Lake Drive in the park. Blue Hole is 60 feet across and 81 feet deep, but there are caverns and rooms that go much deeper. The spring produces 3000 gallons per minute of crystal clear water at 61° F. There is a grate at 110 feet, then the "Tee Pee" room, followed by the second chamber at 230 feet. Scuba divers come from all over to dive in Blue Hole. 18 June 2000. Breakfast at Joseph's was very good: green chile and cheese omelet and brewed decaf. Plus we got to watch the barn swallows while we ate. Santa Rosa to Albuquerque: On I-40, we saw mostly yellow grassland with dark green juniper, cattle, and a few pronghorn antelope. Some pines appeared on a ridge about 50 miles east of Albuquerque. We encountered heavy truck traffic. A bluish sage-type plant grows along the right-of-way. Yellow flowers, lots of sky. It was cloudy and cool, in the 70's. Suddenly the Sandia Mountains loomed ahead, peaks hidden in the clouds. We didn't stop in Abuquerque. It seemed rather jarring in its urban traffic and bustle. Albuquerque to Grants: It was sunny and warmer. 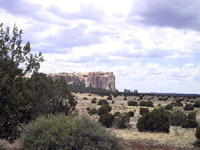 The scenery was mostly yellow grassland and flat-topped hills lined with red rock cliffs, becoming mesas near Mesita. Laguna Pueblo is visible from the highway--a white adobe church, brown adobe homes. We encountered black lava west of Casa Blanca. The salt cedar sopping up what moisture there was to be had in arroyos and creek bottoms was in bloom. I insisted we stop at El Calderon National Monument because there supposedly was an ice cave there. Well, actually the ice cave was down the road in a private park, but we did go for a short hike. El Calderon was an active volcano 115,000 years ago and you can still see the ash and cinders littering the area. There is a bat cave (Mexican free-tail) and a lava tube cave downslope from El Calderon, but we didn't want to spend the time to explore so we turned back. 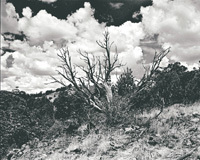 The air smelled of pine, and there were aspen, particularly where there had been a burn, and the crisp, clear New Mexico sky is like nowhere else in the world. I wasn't impressed with the photographic opportunities at El Calderon, though the sky was full of beautiful clouds. 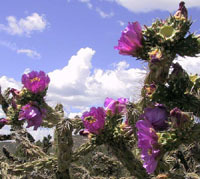 Sybil photographed a lovely cholla in full bloom, and I made a single landscape shot, thinking it would be tough to print because of the contrast. We proceded to El Morro National Monument where we camped in an uncrowded campground amidst unexpectedly lovely pines. El Morro is a great sandstone massif called a cuesta that rises out of the desert about a hundred miles west of Albuquerque. At its foot is a quiet pool of rainwater and snow runoff that provided water to local inhabitants the year round. A cuesta is a long, narrow rock formation with steep sides--it slopes upward to one end where it drops off in a sheer cliff. There were several of these formations in the area, composed of red, white and yellow sandstone. There is a ruin on top of El Morro called A'ts'ina which is the ancestral pueblo of the Zuni. There are petroglyphs on the sheer rock walls. 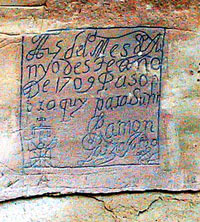 In addition, Europeans have been leaving inscriptions on the sides of El Morro since 1605, when Don Juan de Oñate, first governor of New Mexico, left his missive: "Paso por aquí el adelantado Don Juan de Oñate del descubrimiento de la mar del sur a 16 de Abril de 1605." He had actually been there before in 1598, but this time Oñate was returning from the Pacific ocean, which he assumed he had discovered, and which he called the "sea of the south." He was not necessarily a pleasant fellow, but he was in the new world twenty-odd years before the pilgrims landed at Plymouth Rock. Now, of course, it is illegal to mark on El Morro because it is a national monument, but there are hundreds of pre-twentieth-century inscriptions, many of genuine historical interest. Everyone stopped there because there was always water, whereas most of the surrounding area was and still is desert. When we arrived, the land was parched and brown except for the pine and juniper in higher elevations (just like West Texas). New Mexico and West Texas are both enduring ten-year droughts at this time. Both areas get most of their rain from July through September. But as we started walking the path to look at the inscriptions, a light mist began to fall and we began to hear thunder. It was not very good light for photographing inscriptions, but Sybil nevertheless managed to get some good shots with her Canon S-20 digital camera. Then because of the rain, we decided to expore the top of El Morro the next morning. As we cooked supper in camp the sky got more and more threatening. Finally it began to rain and we retreated to our tent, which faced west. We could see El Morro and the sun peeking through the clouds as it was going down made the raindrops sparkle. We sat quietly for a time watching the sunset. Then Sybil decided to go outside and see if the cliffs behind us were illuminated by the setting sun. They were indeed, and there was also a beautiful full double rainbow that spanned the sky. We then proceded to photograph it with three different cameras. So ended our second day.